Using the correct size is important for an accurate reading. If your cuff is too small, your blood pressure reading will be artificially high. If your cuff is too large, you may get a lower-than-actual reading. 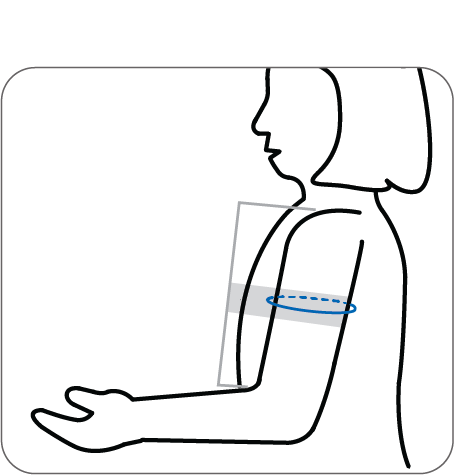 With your arm hanging at the side of your body, measure the circumference of your upper arm at the midpoint between shoulder and elbow. Based on that information, you can determine what size cuff would work for you using the chart below (also available in the instruction manual). All LifeSource units that come with a Medium cuff are compatible with the Large cuff and vice versa. There is an extra Valve in the tubing of the Large cuff that allows the cuff to exhaust at the same rate as a Medium Cuff. If a customer is switching between a Medium and Large cuff, they MUST use the tubing that comes with the replacement cuff, as a Large cuff will not work with a Medium cuff’s tubing, and a Medium cuff will not work with the Large cuff’s tubing. The Easy Fit Cuff is only compatible with the UA-787EJ unit. However, the UA-787EJ is compatible with the three D-Ring cuffs (SM, MED, LRG – purchased seperately) . The Extra Large cuff is ONLY compatible with the UA-789AC model and is not sold seperately. However, the UA-789AC is compatible with two D-Ring cuffs (MED,LRG – purchased seperately). The Only current model that is available for sale with a Small Cuff is the UA-767Plus. A unit that comes with a Small cuff is only compatible with the small cuff. If a customer purchases a unit with a medium cuff, but needs a small, the small cuff will not work on the unit unless the unit is re-calibrated to work with the small cuff. This involves adjusting the exhaust valve and is not recommended as the valve can easily break.